When properly tended, orchids provide a dynamic visual. But ignore their care, and those intricate petals will droop with wilt, and their color will fade from vivid palettes to dull browns and tans. Whether your favorite variety of orchid blooms in winter or spring, Acadian Supply has February care tips for your orchid. Cattleya don’t bloom until spring, so it’s not time for fertilization or heavy watering. Instead, be on the lookout for senescing sheaths. These hollow, yellowish sheaths can trap moisture if left unchecked, leading to bud rot. Staking your orchids is vital to preventing weak spikes due to low light. This is an ideal time to buy healthy orchids from nurseries or wholesale suppliers. If you grow cymbidium outdoors, be careful of damage that occurs when temperatures reach freezing. Indoor orchids should be in full bloom. Watch for slugs, snails, and spots of botrytis due to wet weather. These picture-perfect orchids will bloom any day now. Tie them loosely together to prevent the leaves from interfering with blooms. Resist moving them around, which causes the orchid to reorient itself to the light. Take care not to overwater. New hybrids have no trouble thriving in the cooler season. These orchids offer a burst of color during January and February, with new blooms emerging through spring. Keep an eye on the plant’s pseudobulbs; if they’re shriveled, you’ve been giving your orchid too much or too little moisture. 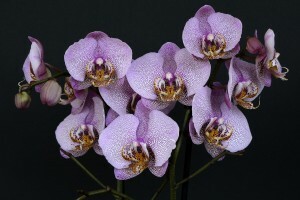 These orchids adapt to a variety of conditions and take to repotting even while in bud. Use Orchiata bark to help these orchids thrive. Stake your orchids now to ensure the vivid spring blooms are displayed to their full effect. Water carefully and remove spent blooms. Don’t risk repotting phalaenopsis orchids in February. Most blooms are already spent, so late winter is an ideal time to repot zygopetalum orchids.